Chuireamar fáilte roimh thrí ghaelscoil áitiúil Dé Céadaoin, 13 Meán Fómhair 2017, do Thráth na gCeist Choláiste Lú 2017. On Wednesday, 13th September 2017, we welcomed three local gaelscoileanna to the 2017 Coláiste Lú Quiz. An Idirbhliain ar an Raidió! 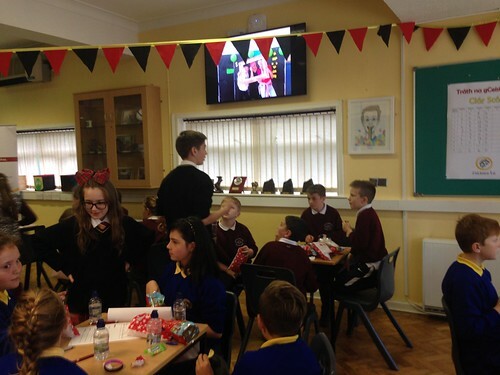 Chuaigh cúpla daoine ón Idirbhliain in air scoil chuig Dundalk FM chun seó Spotlight a thaifead. Chuaigh dhá grúpa ón idirbhliain. Bhí an céad grúpa, Clár, Aoibh agus Naoise ag caint faoí Beyonce, a ceolchoirm i rith an tSamhraidh agus a ceol. Labhair an dara grúpa, Liam, Manus, Fírinne agus Ruarcan, faoí "The Beatles". Phioc siad na amhráin is cailiúla a raibh ag na Beatles mar "Hello Goodbye" agus "While my Guitar Strings Gently Weep". Bhí am íontach acu. Beidh siad ar an raidió Domhnach éigin sa todhcaí luatha!